Your Media Community was likely installed for you. Now you need to configure it. Channels are used to keep different types of media separate. This is important for filtering in the application as well as reporting. Channels also govern geo-fencing. 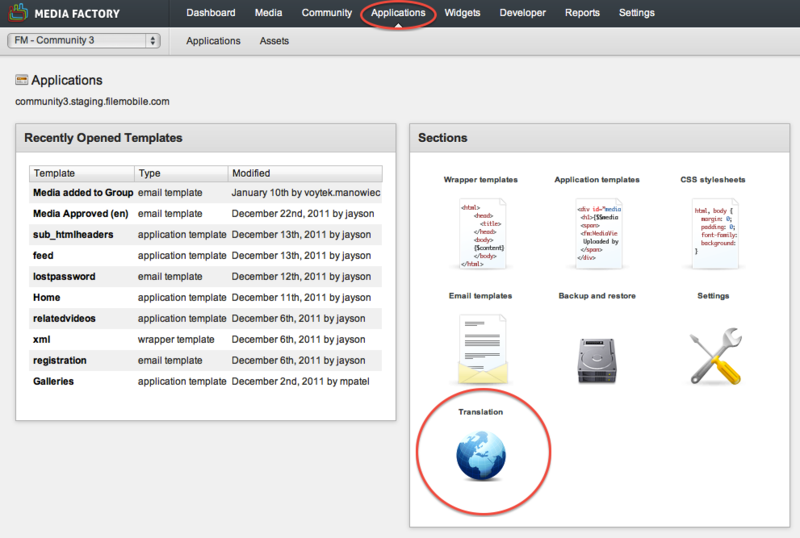 Tip: Check out the article about groups, channels and collections on the Filemobile Blog. Collections are like playlists, and have lots of uses in Media Factory applications. In order to get up and running with the Media Community application, you need to create at least one collection for featured content. In addition to managing language translations for multilingual websites, the Translator tool also manages global variables. One of the first things that you will likely ask yourself is, "how do I see the website?" By default, the application has probably been set up on a URL similar to http://your-app.projects.fm. This URL is configurable in the Settings section of your application.